The American 193rd Tank Battalion played a pivotal role in the capture of Makin in the Pacific in 1943. Makin should have been a pushover. On November 20, 1943, a force of 3,500 highly trained American soldiers invaded this Central Pacific atoll located 2,000 miles southwest of Hawaii in the Gilbert Islands. Opposing them were a mere 284 Japanese naval infantrymen along with some 500 support personnel and civilian laborers. The plan was to overwhelm Makin’s defenders with crushing air and naval barrages followed by an amphibious landing intended to mop up any lingering enemy resistance. Senior U.S. commanders estimated it would take about two days to accomplish this mission. In reality, almost nothing went right for the Americans. Their wood-hulled landing craft could not cross Makin’s barrier reef, so riflemen had to wade 250 yards to shore under heavy machine-gun fire. Critical items such as flamethrowers, rocket launchers, and radio sets all got soaked—with soldiers later paying a heavy price for this ruined equipment. Japanese snipers, hidden within a tangle of fallen trees and shell craters, took an alarming toll on the attackers. Leaders made excellent targets—the American regimental commander was shot between the eyes while rallying his troops. Shocked by the loss of their colonel, raw U.S. infantrymen stopped advancing and took cover. Makin’s invasion was in danger of stalling on the beach. Amid this chaos, soldiers began hearing the deep bark of tank cannons. American armored vehicles had finally made it ashore and were joining the fight. Enemy bunkers began disintegrating under a hail of 75mm shells, while well-placed canister rounds silenced stubborn snipers. No longer pinned down, the GIs continued their attack into Makin’s main defensive area. Makin has been eclipsed in popular memory by the maelstrom of Tarawa, which was seized by troops of the 2nd Marine Division after three days of vicious fighting. The invasions took place simultaneously, but it was the Marines’ bloody assault of Tarawa Atoll’s primary islet, Betio, that made headlines back home. Indeed, Tarawa was a bigger battle. More than 1,600 Americans and 4,600 Japanese perished there compared to relatively light casualties sustained during the Makin landings. Yet Makin distinguished itself as the first amphibious assault conducted by U.S. Army forces in the Central Pacific during World War II. Lessons learned there paved the way for larger operations on Saipan, the Philippines, and Okinawa. Makin also marked the combat debut of armor in an Army-led Pacific landing and was the only time American-crewed Lee medium tanks entered battle against Japan. The Lee was actually a stopgap medium tank equipped with a 37mm cannon in a small traversing turret and a hull-mounted 75mm gun. It was something of an anachronism, harkening back to the days of World War I tank design and put together with a minimum of innovation since the M4 Sherman medium tank was still unavailable in great numbers. The Lee tank appeared ponderous and presented a handsome target to enemy gunners with its high silhouette. However, at the time of its debut no turret was available in the American arsenal that could accommodate a gun heavier than 37mm. These vehicles belonged to the 193rd Tank Battalion (TB). Organized in January 1941, the 193rd was created out of four Federalized National Guard tank companies—the 30th from Forsyth, Georgia (Company A); the 31st from Ozark, Alabama (Company B); the 36th from Houston, Texas (Company C); and the 45th Tank Company from Denver, Colorado (Company D). When Japanese planes bombed Pearl Harbor, the outfit was stationed at Fort Benning, Georgia. Within nine days, remembered Staff Sergeant James Leach, “The 193rd tankers, reequipped with maneuver worn M3 light tanks repossessed from the 2nd Armored Division, were on a troop train headed west to San Francisco’s Angel Island.” Their destination: Hawaii. So unprepared was the Army for war that only a few of the 193rd’s tank crewmen had ever seen, let alone trained on, an M3 Stuart light tank (not to be confused with the Lee designation, which was also M3) before deploying. Nevertheless, the battalion set off for Oahu a few days after Christmas 1941. The 193rd men arrived in Honolulu on January 7, among the first reinforcements to reach Hawaii at a time when the threat of Japanese invasion was very real. Fears eased once additional American forces arrived, especially after February 1942 when the 27th Infantry Division shipped over. Like the 193rd TB, the 27th “Orion” Division was a former National Guard organization, mobilized for Federal duty since 1940. For several months, 27th Division soldiers garrisoned Hawaii’s outer islands. Beginning in November, though, the 27th underwent a relentless training program designed to prepare its troops for jungle warfare. The 193rd TB also underwent intense training while adapting to several changes in organization and equipment. By 1943 it had converted from a light M3 Stuart tank battalion to one equipped with both light and medium tanks. Many crewmen who had just learned to operate their nimble M3 lights now found themselves on the ponderous M3A5 Lee medium tank. American soldiers of the 27th Infantry Division wade ashore on Makin atoll in the Gilbert Islands on November 20, 1943, while a tank makes its way along the beach in the distance. Weighing in at 30 tons, the diesel-engined M3A5 came armed, in addition to the 37mm and 75mm guns, with a .30-caliber machine gun located in its turret. Another .30-caliber could be fired by the driver from his position in the hull. It took seven men to crew the Lee, including three in the turret (tank commander, 37mm gunner, and loader) plus four in the hull (driver, radio operator, 75mm gunner, and loader). The M3A5 was by 1943 an obsolete design, but it still possessed impressive firepower. In the 193rd, Companies A and B fought with mediums. Only four tankers (commander, gunner, driver, and co-driver/radioman) manned the M3A1 light tanks operated by Company C of the 193rd TB. Much smaller than an M3A5 medium, the light tank weighed 16 tons. Its armament included a 37mm cannon and coaxial .30-caliber machine gun in the two-man turret, plus one hull-mounted .30-caliber for the co-driver. Another externally fitted machine gun provided antiaircraft protection. Whether equipped with light tanks or mediums, a tank company in the 193rd possessed considerable battlefield muscle. Organized into three platoons of five tanks apiece plus one tank for the company commander and another for his executive officer, each company rode into combat packing a lethal combination of armor protection, firepower, and mobility. Another tracked vehicle with which the 193rd would soon become intimately familiar was the LVT-1 Alligator. This 14-ton amphibious tractor could deliver up to 24 soldiers or 4,500 pounds of cargo right onto the beach. Typical armament was one .50-caliber and one .30-caliber machine gun. The early model LVT-1 lacked armor plating but was prized by invasion commanders for its impressive handling characteristics both in and out of the water. While the 193rd TB worked to organize and train for combat, senior leaders in Hawaii set their sights on a Central Pacific counterattack against Japan. During the summer of 1943, Allied victories in the Southwest Pacific and Aleutian Islands signaled a turning of the tide. Having checked Japanese expansion, American commanders now sought to retake island bases that had been overrun during the war’s first weeks. The Gilbert Islands, 13 coral atolls straddling the Equator, represented Japan’s outer defensive belt in the Central Pacific. From bases at Makin, Tarawa, and Nauru the enemy could launch long-distance Kawanishi H8K Emily flying boats to attack U.S. supply convoys. This threat had to be neutralized. Admiral Chester Nimitz, Commander-in-Chief Pacific Ocean Areas, also saw an invasion of the Gilberts as the first step in his “island-hopping” campaign across the Central Pacific. He envisioned these atolls serving as stepping stones to the next set of island bases, eventually bringing Allied forces to within striking distance of the Japanese homeland. By August an overall plan for invading the Gilberts—codenamed Operation Galvanic—had taken shape. In overall command was Vice Admiral Raymond A. Spruance of the U.S. Central Pacific Force. The landing force commander, Rear Admiral Richmond K. Turner, had the task of putting ashore two simultaneous amphibious assaults, one at Tarawa and another on the phosphate-rich isle of Nauru. Controlling ground operations was the V Amphibious Corps, commanded by Marine Corps Maj. Gen. Holland M. Smith. 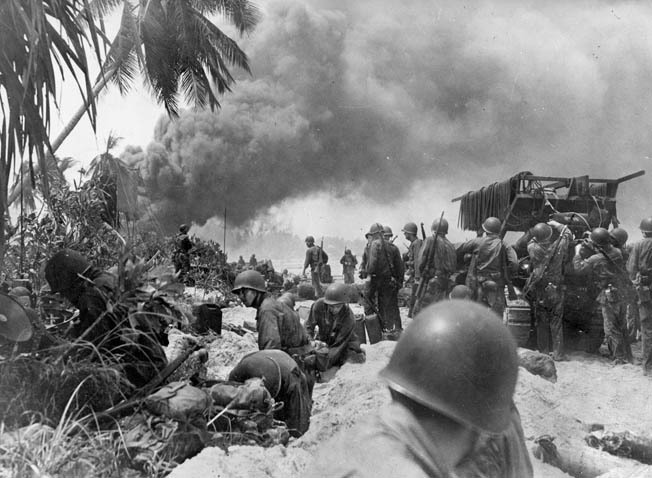 For Galvanic, the 2nd Marine Division was assigned to seize Tarawa while an element of the Army’s 27th Infantry Division got Nauru as its mission. The operation was tentatively scheduled for November 15, 1943. U.S. soldiers move forward on Makin as their amphibious LVT-1 tracked landing craft, nicknamed the Alligator, sits in the foreground. Troops of the 193rd Tank Battalion were detailed to operate the Alligators during the Makin landings. In late September, Galvanic planners scrapped Nauru as an invasion objective, stating it was too far away from Tarawa for naval vessels to support each other in case of a Japanese air or sea counterattack. Makin Atoll, 105 miles north of Tarawa, would be the 27th’s new target. It was not the first time that American forces had visited Makin. Marine Raiders under Lt. Col. Evans Carlson landed there on August 17, 1942, from the submarines USS Nautilus and USS Argonaut. The Raiders battled Makin’s surprised garrison for two days before withdrawing with valuable intelligence. This information later became useful to Orion Division planners. Makin Atoll is a triangle-shaped formation of reefs and islands, the largest of which is named Butaritari. Resembling a crutch, Butaritari stretches out for 13 miles although its average width measures just 500 yards. Heavily vegetated, the island contains many shallow ponds, hidden marshes, and copra plantations. Thousands of bobai pits, deep holes in which a taro-like foodstuff is cultivated, further restrict cross-country mobility. Aerial reconnaissance revealed an active enemy presence on Butaritari. Photo interpreters counted ramps and maintenance structures for five Emily seaplanes, a headquarters complex, radio transmitter facilities, and numerous gun emplacements concentrated in the center of the island. Most of these fortifications, analysts noted, were pointed out to sea in the direction from which Carlson’s Raiders struck. The lagoon side, segmented by four piers or wharves, appeared lightly defended. Protecting the flanks of Butaritari’s main defensive area, nicknamed The Citadel, were two zigzag trenches. Known as the West Tank Barrier System and the East Tank Barrier System, these barricades figured greatly in the assault force’s tactical plan. Intelligence officers estimated Makin’s garrison at 280 naval infantrymen of the 3rd Special Base Force under Lieutenant Seizo Ishikawa. Including marooned air personnel and civilian construction laborers, approximate enemy strength totaled 800 men. Several howitzers, dual-purpose antiaircraft/antitank guns, and even two Type 95 light tanks formed the backbone of Ishikawa’s defenses. Butaritari also bristled with dozens of machine-gun bunkers and rifle pits. Major General Ralph C. Smith, 27th Division commander, assigned the Makin assault to his 165th Regimental Combat Team (RCT). Led by Colonel Gardiner J. Conroy, the 165th Infantry could trace its lineage back to the “Fighting 69th” of Civil War fame. Reinforcing Conroy’s RCT were several support units, including a field artillery battalion, signal, engineer, and medical detachments plus the entire 3rd Battalion, 105th Infantry Regiment for use as a special landing party. Late in September, the 193rd TB also received orders attaching it to the Orion Division. The battalion commander, Lt. Col. Harmon L. Edmonson, learned his mediums from Company A and lights belonging to Company C were now part of the Makin operation scheduled to begin in six short weeks. Edmonson received another startling request. The 27th wanted to use LVT-1s to put ashore its special landing detachments, but no one knew how to operate these amphibious tractors. Could the 193rd crew them? Using the one available Alligator on Oahu, 193rd Battalion Executive Officer Major M.L. Inskeep formed a detail of Headquarters Company soldiers and within two weeks turned them into LVT drivers. Later, 48 factory-new LVT-1s would show up just in time to load into the Landing Ships, Tank (LSTs) bound for Makin. Meanwhile, the rest of the landing force began making frantic preparations for battle. Unfortunately, all this activity left little opportunity for tank-infantry familiarization. The tankers also discovered their radios were incompatible with those used by the 165th RCT. Precombat rehearsals would have straightened out these issues, but there simply was not enough time for proper training. While smoke billows from stricken Japanese positions on Makin, American combat engineers lay a metal mat across the soft sand to allow tracked and wheeled vehicles to move forward without becoming mired in the terrain. On November 10, Company A of the 193rd loaded its medium tanks onto Landing Craft, Tank (LCTs), which then steered into the cavernous USS Belle Grove. Known as a Landing Ship, Dock, this strange vessel could flood its well deck to float out the LCTs with their medium tanks aboard. Company C’s light tanks were driven onto smaller Landing Craft, Mechanized (LCMs) and distributed among the invasion fleet. The Northern Task Force (minus five slow-moving LSTs carrying Major Inskeep’s LVT-1s, which had left five days earlier) then set sail to rendezvous off Makin. During its passage, Consolidated B-24 Liberator heavy bombers of the Seventh Air Force saturated Butaritari with tons of demolition bombs. Betio, the main enemy stronghold on Tarawa, received an even more extensive preinvasion “softening” by Army Air Forces and Navy aircraft. Operation Galvanic had begun. Heading for the Gilberts were thousands of soldiers, sailors, airmen, and Marines, all determined to initiate Admiral Nimitz’s Central Pacific island-hopping campaign. D-day was now set for Saturday, November 20, 1943. The Makin operation would open at 0830 hours with two Battalion Landing Teams (BLTs) landing along Butaritari’s western shore—the “arm” of the crutch—on beaches designated Red One and Red Two. Also set to hit the Red Beaches were the 1st and 2nd Platoons of Company C, 193rd TB, riding M3A1 light tanks. This force was then to advance on the West Tank Barrier System, two miles to the east. 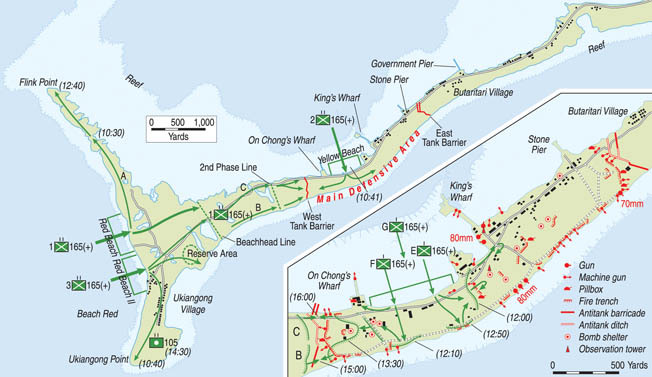 Providing the Red Beach landings went well, at 1030 an additional BLT would enter Butaritari’s lagoon and assault the island center on Yellow Beach between On Chong’s Wharf and King’s Wharf. Accompanied by 17 M3A5 Lee medium tanks of Company A, 193rd TB and five Stuarts from Company C, this BLT was to strike across Butaritari before wheeling to the west. The Americans would then advance through the Main Defensive Area to link up with other elements moving eastward from the Red Beaches. Special landing detachments from the 3/105 Infantry, riding in LVT-1s, were to form the first assault wave for all beachheads. After securing the landing areas, these riflemen would establish blocking positions intended to cut off any Japanese defenders trying to escape from or counterattack the main invasion force. If performed correctly, this complicated maneuver promised to pin the enemy between two powerful U.S. assaults. Yet the plan was fraught with problems not apparent to the inexperienced Orion Division. The danger of fratricide—friendly fire—increases markedly whenever two units approach the same objective from opposite directions. Superb radio communications, fire discipline, and small unit leadership were crucial to the success of such a scheme, and the untested 165th RCT did not then possess these battlefield skills. Although Makin atoll was a small spit of land in the Gilbert Islands of the Central Pacific, it was extensively fortified by its Japanese occupiers. The Japanese built strongpoints of coconut logs, sand, and concrete. An uncooperative enemy further disrupted the 27th’s plan. Simply put, most of the Japanese on Butaritari had taken shelter far from where American intelligence officers believed they would be. The massive preinvasion bombardment—an estimated four million pounds of high explosives—did little more than to momentarily stun Makin’s defenders and leave them a perfect warren of downed palm trees, shell craters, and rubble in which to hide. Still, one could not ignore the overwhelming U.S. advantage in combat troops, armored firepower, and naval gunfire support. Observers offshore certainly felt a sense of confidence in the predawn hours of November 20 when those big guns opened fire. Meanwhile, a flotilla of landing craft, led by the ungainly LVT-1s, began assembling in the calm waters west of Makin Atoll. Jockeying into assault formations, waves of boats and tractors then headed toward the beach. Finally, after a flight of U.S. Navy fighters strafed Butaritari end to end, the invasion began. At 0829 hours, one minute ahead of schedule, the first Alligators rolled out of the water onto Red Beaches One and Two. As soldiers of the 3/105 Infantry leaped out and took cover, only an eerie silence greeted them. Makin, they thought, was going to be a pushover. An unexpected reef forced Engle’s LCM to drop its ramp 40 feet off the beach, but his M3A1 had been fitted with a deep water fording trunk and waded in with little difficulty. The other tanks also successfully made it ashore, moving inland to predesignated assembly areas. In the meantime, American infantrymen advanced eastward against growing resistance. Butaritari’s defenders had shaken off their initial shock and were beginning to fight back. Snipers hidden in treetops picked off unwary GIs while the chatter of well-camouflaged Nambu machine guns drove entire platoons to cover. Stalled by Japanese sharpshooters and the torn up terrain, infantry commanders began pushing their riflemen forward. This exposed those leaders to deadly enemy fire. On the north (lagoon) side of Butaritari, 2nd Lt. Daniel T. Nunnery of the 1st BLT was killed in an ambush that also injured several of his men. When chaplain Captain Stephen J. Meany went out to render aid, he took a serious wound to the chest. The regimental commander, Colonel Conroy, saw it all. Stating he was going back for a tank, Conroy stood up in full view of the Japanese position. A rifle cracked, and the colonel fell dead. Command of the 165th Infantry passed to Lt. Col. Gerard W. Kelley of the 1st BLT. Those light tanks so desperately needed on the front lines instead remained parked in their assembly areas. It took three hours for the armor to organize along Red Beach’s rocky shore and more time to sort out command authority. Initially, the tankers refused to obey orders from infantry officers. Captain Charles B. Tobin, commanding Company C, eventually got them on the road, but precious hours had already been wasted. Despite considerable confusion and the loss of their regimental commander, U.S. forces advancing from the Red Beaches had performed well. As of mid-afternoon they controlled Butaritari’s main road and were busy wiping out one last pocket of resistance along the West Tank Barrier. The assault on Yellow Beach faced stiffer opposition. Following another furious naval barrage, American landing craft entered Makin’s lagoon at 0952 hours and headed toward shore. First in were the LVT-1s, driven by 193rd TB personnel. A line of barges followed 900 yards back, carrying the M3A5 mediums of Company A, a platoon of light tanks, and Lt. Col. Edmonson’s two headquarters tanks. Behind them rode wooden-hulled LCVPs loaded with infantrymen from the 2nd BLT. As the first wave approached, enemy machine guns from King’s Wharf and several half-sunken ships caught the Alligators in a lethal crossfire. LVT crewmen shot back with their .50-caliber machine guns. The tractors then clattered up on land, where riflemen from the 3/105 Infantry dismounted to clear out the threat. An American M3 light tank lies immobilized in a large shell crater on Makin. The tank soldiers nearby appear to be considering options to remedy the situation that occurred on the first day of the fight. What could not be seen was an underwater coral reef extending 250 yards into the lagoon that blocked passage for flat-bottomed landing craft. It forced the infantrymen to wade through waist-deep water, ruining their poorly waterproofed radios, bazookas, and flamethrowers. Worse, they were lashed by Japanese automatic weapons fire all the way into shore. The tanks, although fitted with wading stacks, faced an even more daunting obstacle hidden in Butaritari’s lagoon. Preinvasion bombardment had left deep shell holes under the water’s surface, invisible to tank drivers. Captain Robert S. Brown, Company A’s commanding officer, lost his M3A5 to an unseen crater, as did Sergeant Jean O. Newby, commander of Medium No. 17. Twelve medium and four light tanks survived the landing, immediately going to work against Japanese fortifications. The tanks’ incompatible communications systems, however, made cooperation with the infantry an almost impossible task. Fighting buttoned up, crewmen could only see the battlefield through glass periscopes. Disoriented tankers were forced to hold their fire, unable to tell friend from foe amid the chaos of battle. Into this crisis stepped Captain Wayne C. Sikes, the 193rd TB’s operations officer. Using arm and hand signals, he directed a platoon of medium tanks forward against the enemy’s network of rifle pits. Their 75mm high-explosive shells made short work of these log dugouts. As American troops advanced into the heavily fortified Citadel area, they encountered several concrete pillboxes that remained impervious to the tanks’ cannon fire. On the fly, infantrymen, armor crews, and combat engineers improvised a tactic for reducing these dangerous strongpoints. Lieutenant Colonel John F. McDonough, the 2nd BLT commander, described their method of operation: “We run a tank up to a revetment and blast it with the 75mm guns. Then engineers run in with a TNT charge, poking it into the revetment with a long pole.” By 1700 hours, the GIs had eliminated 10 to 15 enemy positions in this manner. Japanese resistance throughout the Main Defensive Area crumbled rapidly. One section of medium tanks bypassed The Citadel to link up with Lt. Engle’s light tanks approaching from Red Beach. Another platoon reached the ocean side of Butaritari, where it found several abandoned dual-purpose gun emplacements. More tanks headed east but were forced to withdraw when they encountered unexpectedly heavy enemy fire near King’s Wharf. 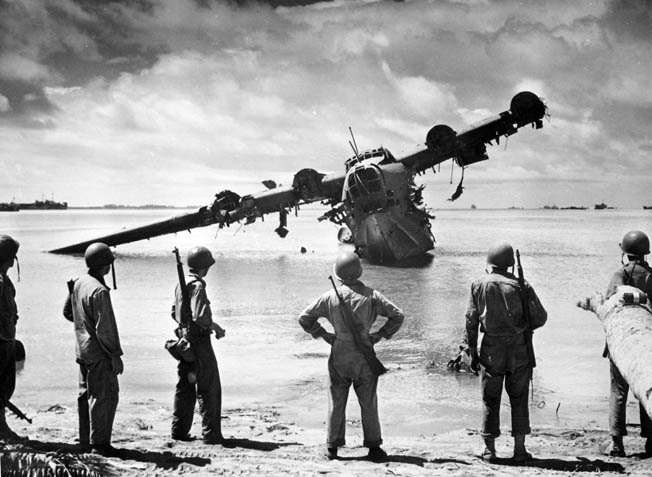 After Makin has been secured, American soldiers inspect the wreckage of a Japanese Kawanishi H8K flying boat that lies in the surf. The aircraft was damaged during the preinvasion bombardment and then used by the Japanese defenders as a machine-gun position. Nightfall brought on a lull in the action. The 193rd TB gathered its tanks and LVT-1s into assembly areas, where crewmen performed much needed maintenance. Normally they would have refueled and rearmed here as well, but poor landing conditions on the Red Beaches prevented much needed supplies from reaching shore. One tanker from Company A and another belonging to Company C were killed that first night when they left their foxholes to pursue enemy infiltrators. It remains unknown whether these men died as a result of friendly fire. Another tank commander was shot in his hatch by a Japanese sharpshooter. Dawn on November 21 revealed new problems. Enemy gunners had managed to reoccupy King’s Wharf and were sweeping Yellow Beach with deadly automatic weapons fire. Four medium tanks rolled up on shore and silenced them with 75mm shells. The mediums then shifted their fire to a ruined Emily seaplane, from which another machine gun threatened beach operations. Eighteen Japanese bodies were later found in the wreckage. Due to sniper activity, light tanks were employed to drag supply pallets from dumps on Red Beach to troops fighting in the center of Butaritari. Bad luck plagued this effort as a Navy dive bomber accidentally dropped its payload on four M3A1s, killing several nearby infantrymen. After its original occupants have been killed, an American soldier stands in the entrance to a Japanese bunker on Butaritari. 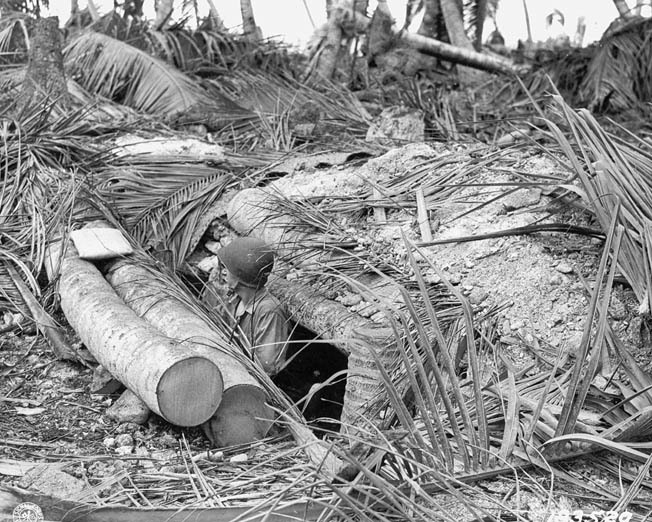 Heavy coconut logs that were used to reinforce the enemy strongpoint. By 1100 hours the tanks on Makin had been fueled and rearmed. They then joined Lt. Col. McDonough’s battalion in a frontal attack on Japanese positions covering the East Tank Barrier System. Rough terrain restricted mobility, but the Americans were learning to fight as a team. 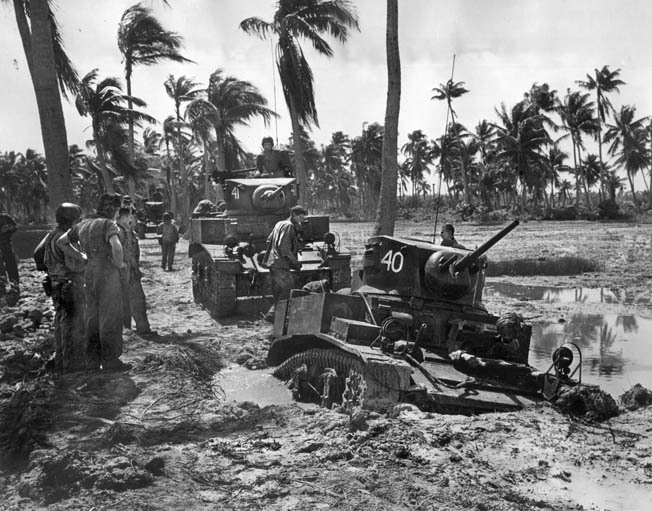 Light tanks operating on the lagoon side of Butaritari helped U.S. riflemen gain 1,000 yards of hotly contested ground that day, yet the foe showed he was still full of fight. The East Tank Barrier System remained in Japanese hands; to seize it would require a concentrated effort. Nevertheless, American commanders felt one more day of vigorous action should wrap things up on Makin. At 0700 hours on November 22, a U.S. artillery barrage pounded enemy positions along the East Tank Barrier. The fresh 3rd BLT, joined by light and medium tanks, surged forward to finish the job. A captured map found the day before helped tank crews pinpoint and eliminate enemy emplacements. Meanwhile, other 193rd TB soldiers were making a daring amphibious end run in their LVT-1s. Carrying a company of riflemen, these raiders cruised far up along Butaritari’s shoreline in an attempt to cut off the enemy’s retreat. The effort went for naught, though, as friendly natives informed U.S. officers they were too late—the Japanese had already escaped to neighboring atolls. Another detachment of Alligator-borne GIs swung wide to occupy the island of Kuma off Butaritari’s eastern tip. There they encountered and killed 10 enemy combatants trying to flee the battlefield. Across Butaritari the mood was one of cautious optimism. American forces had advanced three miles that day while encountering only sporadic opposition. Tankers of the 193rd returned to their assembly areas for the night, confident their job was nearly done. Headquarters had already issued orders for some units to begin reembarking come morning. Two Lee medium tanks shell King’s Wharf on Butaritari during the second day of combat. Japanese troops had set up machine gun positions near the wharf during the night, to fire on landing barges unloading supplies. To the east, Lt. Col. Joseph T. Hart’s 3rd BLT dug in 5,000 yards from the tip of Butaritari. Shortly after dark a party of fleeing natives ran into Hart’s front lines, followed immediately by the first of several Japanese suicide attacks. There appeared to be no organization to these saké fueled bayonet charges. Still, they went on all night and caused numerous American casualties. Hart’s infantrymen held their ground, however, and after daybreak U.S. patrols counted 51 enemy dead in front of their positions. Final combat operations occurred on the morning of November 23. Five light and 16 medium tanks accompanied Lt. Col. Hart’s battalion to the village of Tanimaiki, on Butaritari’s eastern point. This task force encountered several sniper nests along the way, all of which were quickly eliminated by shotgun-like blasts of canister ammunition from the tanks’ 37mm guns. Tank fire also destroyed an air raid shelter near the island’s tip, killing two Japanese holdouts. Butaritari had been secured. At 1130 hours the 27th Division commander, Maj. Gen. Smith, radioed “Makin Taken” to Admiral Turner. A few hours later, Orion Division troops began moving back to their transport ships. The 193rd’s Company C left behind its 3rd Platoon to assist with mopping-up operations. Capturing Butaritari took 75 hours and the lives of 218 Americans. For its part, the 193rd TB suffered four men killed in action and 16 wounded. These comparatively minor losses cause many observers to believe that Makin was an “easy” invasion. The facts tell a far different story. Tank Platoon Leader 2nd Lt. Murray Engle agreed. “There is a great lack of communications between tanks and front line troops. In the tanks, vision is so limited that the crew can’t pick out any targets.” Engle concluded by stating that small unit training should improve this situation. Despite the problems, much went right at Makin. Overwhelming U.S. firepower dominated the battlefield, pulverizing enemy defenders who chose death before surrender. The tank-infantry-engineer team quickly mastered bunker-busting operations. Technological innovations like the LVT-1 also provided a tactical edge that contributed to the ultimate American victory in the Pacific. Starting with the Gilbert Islands, tanks participated in every American offensive action across the Pacific. Their armored power proved decisive on many island battlefields and helped win the war against Japan. Tags Admiral Chester A. Nimitz, Aleutian Islands, Allies, Axis, Battle of Makin, Belle Grove, Evans Carlson, General Lee Tanks, Gilbert Islands, Japan, Japanese, Landing Vehicle Tracked (LVT), Marine Raiders, Pacific Theater, Raymond Ames Spruance, Richmond Kelly Turner, Stuart tank, Tarawa, U.S. Army.